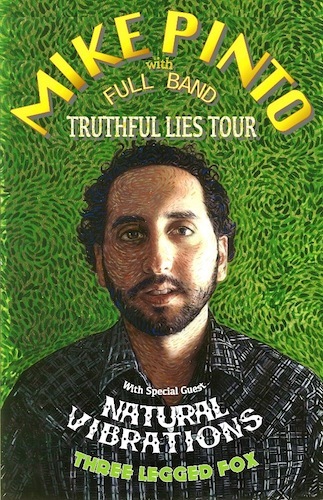 San Diego, CA - April 2, 2013: Mike Pinto will take to the road on the Truthful Lies Tour with his full band in support of his forthcoming LP of the same name. The tour starts on May 16 in Long Beach, CA, making 48 stops up and down the West and East Coasts. Pinto and his band (Mike Hatton on bass, Brian Daggett on drums, Max O'Leary on trumpet and Jon Cestero on tenor sax) are gearing up for the tour ready to throw everything into it to make it a summer to remember for everyone fan who comes out. His distinct musical stylings have struck a deep chord with the reggae and roots faithful, and this will be his largest headlining tour to date. The tour includes stops at Cali Roots Festival, the Rockin' Roots Festival and KTAOS Solar Fest. Joining Mike Pinto on the tour will be Hawaiian sons Natural Vibrations, and Philly's Three Legged Fox, making this a standout tour for the reggae, funk, rock and roots circuits. Truthful Lies is set for release on May 14th; it will be Pinto's fifth release, following up Little District (2005), Mike Pinto (2007), Everything I Got (2009) and The West is Still Wild EP (2012). Guest Appearances on Truthful Lies include a stellar lineup of musicians, including: Junior Marvin (Bob Marley), Jesse Wagner and Roger Rivas (The Aggrolites), Micah Brown, George Laks (Lenny Kravitz), Chuck Treece (Bad Brains, G Love, McRad). The album, recorded mostly at Soundmine Studios, East Stroudsburg, PA by Dan Malsch (The Misfits), as well as some tracks by Lew Richards at 17th Street Studios in Costa Mesa, CA, will contain up to 17 tracks, 16 of which are previously unreleased. The album art, which is revealed in the tour poster, was created by Jimmy Ovadia out of Ocean Beach, San Diego. It was designed to have an ethereal spin to it, while being boldly impressionistic, ala Van Gogh. Mike Pinto gave his personal insight as to what to expect from the album: “Truthful Lies is going to have all different genres, including reggae, folk, rock n’ roll, early funk, and more. I'm looking forward to collaborating with several artists on this disc. There’s definitely going to be a mix of my old style and as well as getting dynamic with a transition to other new genres as well. I feel it's my best and most diverse material to date, and I can't wait for people to hear it."